Trivia Night, Student Reflection, and More! Students and leaders from The Vine freshly arrived in El Paso for our Border Immersion Trip in January. It's a strange time on college campuses. Activity is reaching a fever pitch as it comes time for all things "end of the year" -- assignments, performances, thesis presentations, club meetings, and more. This means that our students are both busier than ever and feeling a hint of nostalgia or even grief for a school year almost done. This is especially true for those who are graduating and going on to new (and often unknown) adventures. So while we proclaim to them the Easter promise that new beginnings are on the other side of every ending, we also take time in this season to look back and celebrate and give thanks for all that God has done in our lives this year. This newsletter is our invitation to you to celebrate and give thanks along with us. The stories and pictures that follow are just a glimpse of the good things that have happened this semester in The Vine campus ministry network and that ways that Christ is being made known among our students. In this "end of the year" moment, we hope you will enjoy celebrating with our students and we ask you to keep them in prayer as they move through endings into new beginnings. P.S. None of this awesome campus ministry is possible without your generosity. If you haven't yet given this year, please consider giving to support The Vine. Your gift will touch students today and help to nurture the future of Church. Thank you! Students at a PRiSM dinner in February discussed Acts 10 as part of a series on "weird Bible stories." As anyone who has walked across Washington Square Park on a nice fall day can tell you, Manhattan’s Greenwich Village neighborhood is abounding in students. In an effort to serve this population, The Vine has partnered with local congregations to launch a new ministry branch: PRiSM. 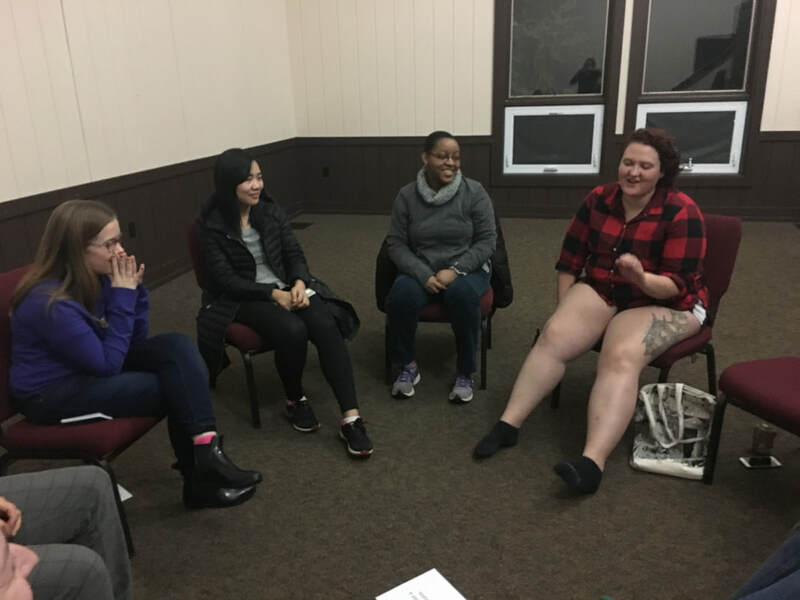 PRiSM, which stands for Progressive Student Ministry, is an ecumenical student community meeting weekly on Tuesday evenings at First Presbyterian Church near Washington Square. PRiSM is a partnership between LMHE and four congregations: First Presbyterian Church, Gustavus Adolphus Lutheran Church, St. John's Lutheran Church, and Trinity Lower East Side Lutheran Parish. Each Tuesday evening, students from NYU and The New School share in a home cooked meal and engage in conversation around faith, scripture, and contemporary issues. After dinner, students are invited to a contemplative Jazz Vespers worship service. PRiSM seeks to offer a thoughtful, inclusive witness to the Gospel, which students have indicated is a much needed alternative to some of the dominant religious voices on campus. During this first full year of PRISM, students have engaged in rich conversation on topics ranging from Christian mysticism, to liberation theologies, to studying "weird bible stories," and more. The Vine is excited to continue to explore how this young ministry can faithfully serve students in creative new ways. Interested in keeping up with PRiSM’s activities or getting more involved? Follow PRiSM on Facebook! 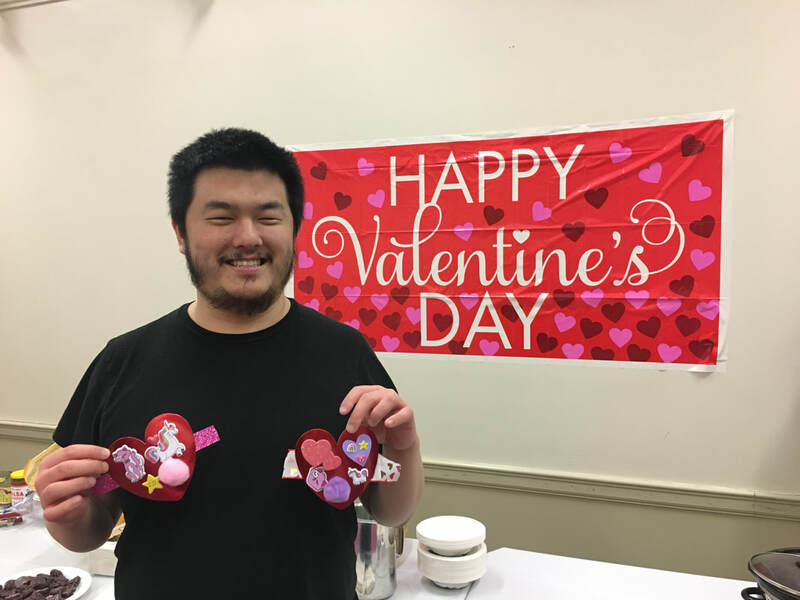 Grad student, Kellan, at PRiSM's Valentine's Day Study Break. 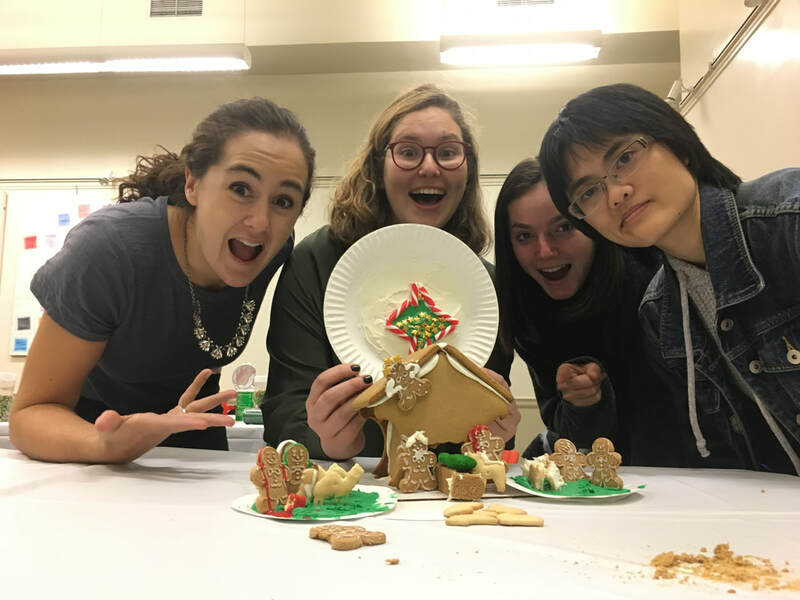 PRiSMers show off the gingerbread nativity scene they built during Advent. 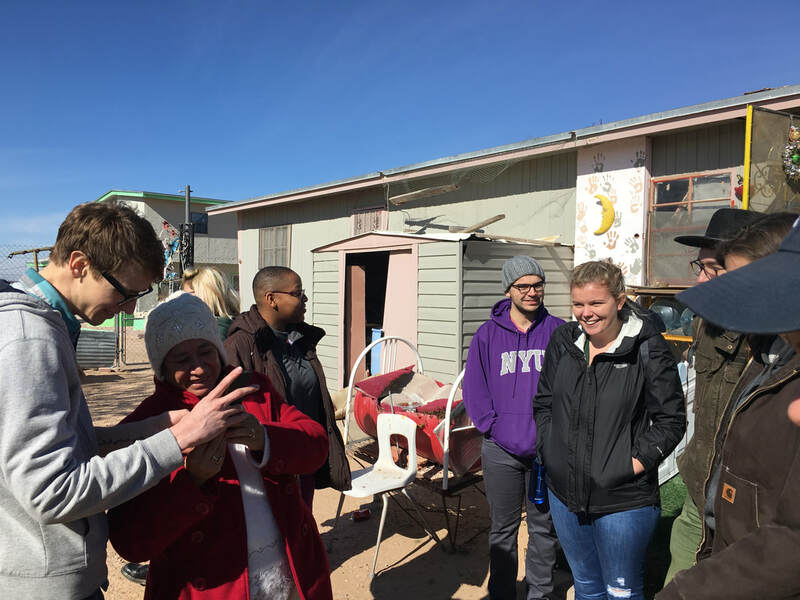 Over January break, fourteen college and graduate students from The Vine’s citywide campus ministry network and three ministry leaders travelled to El Paso, Texas to participation in a weeklong Border Immersion Trip. Unlike a traditional “mission trip,” the purpose of the immersion was to hear the stories of neighbors affected by the broken realities of the border, learn about how immigration "issues" affect real people, and to grow in relationship with siblings in Christ whose lives and experiences are very different than our own. The Vine group was hosted by Iglesia Luterana Cristo Rey, an ELCA congregation in El Paso that has been running immersion programs for over 20 years. 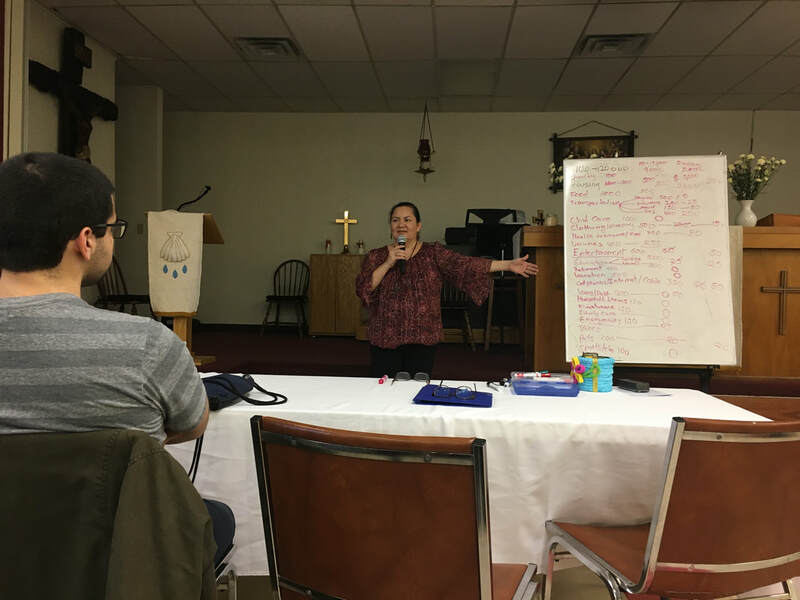 The students were privileged to learn from the wisdom of Pastora Rose Mary Sancez-Guzman and her parishioners, many of whom are undocumented. Pastora Sanchez-Guzman shepherded the group as they visited federal court and spoke with an immigration judge, were welcomed into the homes of undocumented people living in impoverished “colonias” or neighborhoods outside El Paso, visited a medical clinic for the underserved poor in Juarez, and helped make a meal for asylum seeking families recently released from detention, among other things Students engaged in ongoing reflection, bible study, and worship throughout the week. Now that the group has returned home, students are eager to share their experiences and learnings. As one student reflected, "At the border this week, I saw pain, love, and dedication I had never envy conceptualized before. I saw a very small piece of a very large problem, and I do not claim to be any kind of expert because of it, but now I want to share what I took away." In addition to giving presentations in their local Vine branches and at partner congregations, students are also planning a teach-in on immigration issues for the wider student community in Manhattan this May. The trip to El Paso was an incredibly transformative experience for The Vine Community. Thank you to the Advent Mission Fund, St. Peters Fund for Special Ministry, and Thrivent for the generous grant funding that made this trip possible. Students visited with people living in the "Colonias" outside El Paso. Young Adult Volunteer, Kori Robbins (right), shares ashes and prayer on Broadway on Ash Wednesday. Kori Robbins hails from Anaconda, Montana, and has spent the past seven months working in New York City with the Young Adult Volunteer (YAV) program, through the Presbyterian Church USA. The YAV program allows students to spend a year engaging in faith-based volunteering in communities across the country and world. 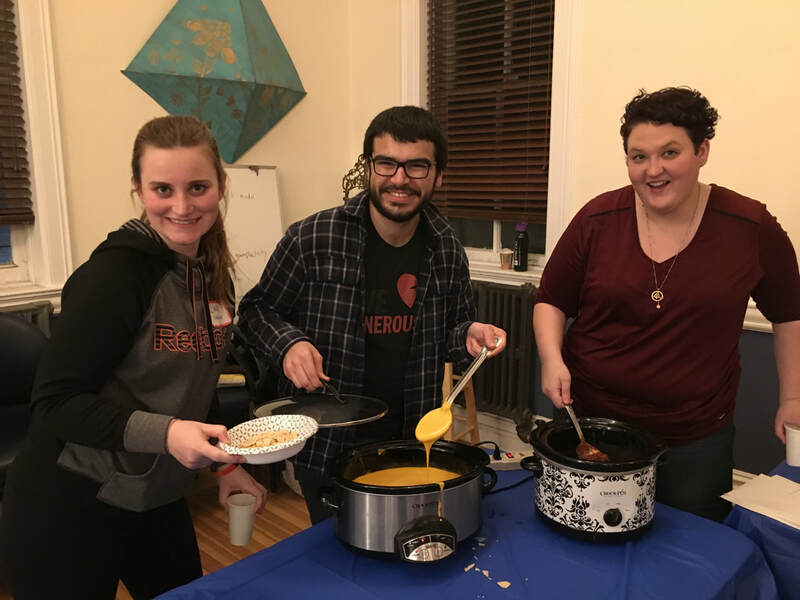 They work for a wide variety of ministries in these locations, and the New York City YAVs frequently join LaMP, The Vine’s branch in the Morningside Heights area, during their year of service. Kori has been actively involved with LaMP since moving to the city, attending weekly meetings, retreats, and participating in fundraisers such as Trivia Night. She appreciates the friendships she has made through this community, and values having a space to further engage in faith-based dialogue. 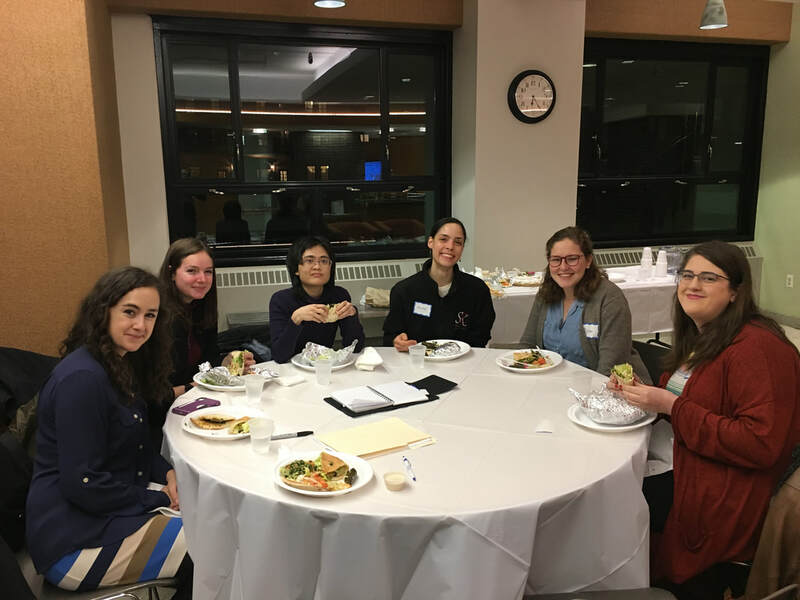 The YAVs’ engagement with the Morningside Heights student community has opened up opportunities for college undergraduates to learn about faith-based volunteering opportunities across denominations and explore this as a post-graduation possibility. We are grateful for the presence and witness of young adult volunteers like Kori in our campus ministry community! Kori shares a story on our fall retreat in New Jersey. Kori helps serve nachos at LaMP's Late Night Study Break in March. The good folks of St. Luke's Lutheran Church in Times Square came decked out and ready to compete! On Friday, February 22, about a hundred people donned their cowboy hats, boots, and plaid and headed to LMHE’s Trivia Night fundraiser! Trivia Night is an annual gathering where students, congregations, and other supporters of The Vine campus ministry network gather to engage in a little bit of friendly competition, eat delicious food, and support ministry with students. This year’s Trivia Night was Rodeo-themed, and competitors dressed to impress in the wild west, enjoying delicious “Pepper Bellies" (i.e. chili with all imaginable toppings inside a bag of Fritos), and answering trivia questions in eight rounds, covering topics such as early explorers and movie actors. During breaks between rounds, Anna Mortiz, an NYU student involved in PRiSM, and LMHE board member, Carolyn Riehl, each shared meaningful reflections about LMHE’s impact on students in New York City. Sixteen teams competed in the event, while purchasing raffle tickets for baskets of goodies donated by LMHE board members. The winners of the trivia competition were the "Righteous Ranchers" from Trinity Lutheran Church in Long Island City/Astoria - an impressive feat for a first-time team at the competition. All in all, Trivia Night raised over $3000 for ministry with students. Thank you to everyone who came out and gave their support! Gustavus Adolphus Lutheran Church generously hosted Trivia Night. 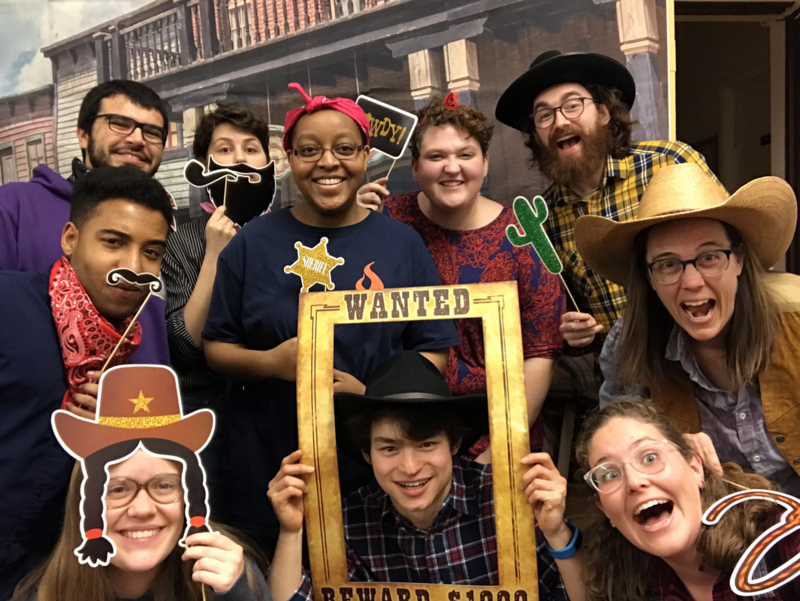 The Vine student team poses in the Rodeo photo booth. Vine students visited the detention center in Elizabeth, NJ with Seafarers International House. Aurora Celestin is third from the left. The following is a reflection by Columbia College Junior, Aurora Celestin, on her experience visiting asylum seekers in immigration detention with The Vine. This year, as I have passed the halfway mark in my undergraduate career at Columbia University and have had to think more concretely about my end goals, I have been asking myself more what do I care about?. In mid-November 2018, I was fortunate enough to have an opportunity that touched me greatly and allowed me to engage with an issue that weighs on me. With the help of Seafarers International House, I and a group from The Vine were able to visit an immigration detention center in Elizabeth, New Jersey. A consistent theme across many of my Columbia classes has been the “unheard” voice and the erased or misrepresented experiences of the marginalized and oppressed. Going to the detention center gave me the chance to interact with someone whose voice had been devalued. There, my small group was permitted to speak with an African asylum seeker. However, during our short time with him, we mostly just listened to this man, clad in a prison-style jumpsuit, tell his own narrative. It was a story about fleeing danger, struggling to maintain familial ties with his family split up across 2 continents and 3 countries, and fighting to use his expertise to defend himself as those charged with defending him jeopardized his future with their incompetence. ​It was a profound experience to listen to him with his passionate, intellectual, charismatic, and emotional voice seize the chance to be heard and to confide in us. It was equally meaningful for me to become part of a chain of voices and serve as messenger to update Seafarers about this man’s case so they might provide him with some support. In the end, through this moving, up close experience, I realized that there is important work we all can do in the simplest of tasks that can help combat the harm being done by our immigration system. May God guide us to those voices in need of a listener and empower us to help others’ stories see the light of day. Thank you, Aurora, for your thoughtful reflections and inspiring us with your faith put into action! The Vine NYC is a network of big-hearted, open-minded campus ministries serving college and graduate students across New York City. The Vine connects students with peer faith communities, local congregations and the Gospel of Jesus Christ. The Vine is a ministry of Lutheran Ministries in Higher Education in partnership with local congregations.